Click the button below to add the Evidence for the Bible (Part 1): Ten Reasons You Can Trust the Scriptures (DVD) / Third Edition to your wish list. Was the Bible written by deceitful men? Is the Bible out-of-sync with scientific discoveries? Has the Bible undergone corruption as it was translated down through the centuries? Are the persons, places and events mentioned in the Bible mythological? What sets the Bible apart from other religious writings like the Quran, Hindu Vedas, or Book of Mormon? Charlie Campbell has been researching answers to questions like these for more than twenty years. In this updated, expanded, third edition DVD he answers these questions as he builds a compelling ten-pronged case for the trustworthiness of the Bible. In this visual PowerPoint presentation, you’ll learn about. . . This DVD was shot in a widescreen format and contains more than 200 of the images Charlie uses in his PowerPoint presentation. DVD length: 83 minutes. Part two to the DVD (above) is available here: Evidence for the Bible (Pt. 2): An Examination of Apparent Contradictions in the Bible. I purchased this video after a couple of my students questioned the accuracy of the Bible. My students enjoyed it so much we spent over a week on it. It was really eye-opening for some of them. Charlie presented several great points as to why we can trust the Bible and answered some common objections. Thanks for this valuable tool! I have been a Christian and going to church since 1976. This is the best teaching I have heard in all my thirty plus years being a Christian. So clear. So compelling! I am a new believer and this video has amazed me. Even after my relationship with God became stronger, I still had questions about the Bible and just certain things that confused me. After watching this video I came into a huge revelation about God and His works in the Bible. I guess I just needed a little proof to the facts of what is written in the Bible, and this video has clearly shown them to me. So much so that I can only humble myself before God and His amazing works and power! Charlie Campbell is a wonderful speaker, who is witty and intelligent and I love the power point slides. I have already recommended this video to everyone who I talk to! Great job! I played this teaching for my apologetics class. Everyone loved it. What could be more important than knowing we can live by and trust the BIble? Thanks Charlie! This is such a great DVD for all people of faith and those who do not yet know the Savior. We have loaned it to our grown children who watched it with their children and they also loved it. The pictures shown are outstanding, especially those of the galaxy of stars. Amazing!! I highly recommend this to all. Very Informative...Full of Useful Information. This is a very informative video that keeps your attention and is full of useful information. I enjoyed it very much and have watched it several times. The video flows well and it's made even better by Charlie's power point slides. I also showed this to my girlfriend who enjoyed it very much as well. This has not only strengthened my faith in the Bible but it has also caused me to be more bold when coming in contact with nonbelievers. I ordered this to share with a friend at church (and my sister-in-law) because they are new believers, and have shared that they have heard people give reasons why they shouldn't trust the bible. I bought Charlie's MP3 set last year, and was looking for a message called "Amazing Evidence for the Reliability of Scripture," but this is the updated version of that, and it is every bit as awesome. If you are a believer, this message will strengthen your faith. If you are not a believer, this will make it pretty hard to stay that way. Being a Christian requires faith (Heb. 11:6), but not that much! God has provided so much evidence, coming to Him requires much less faith than most other worldviews/religions! In this DVD, Charlie lays out tons of evidence for the Bible being trustworthy. I highly recommend it. I have seen and heard Charlie on several occasions, and as usual this video keeps your interest and is easy to understand. I had my 10 year old daughter watch this with me, hoping it would be a great conversation starter… It did not disappoint. 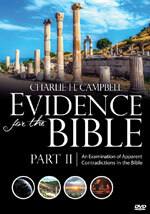 I just finished watching Charlie Campbell's DVD the Evidence for the Bible and all I can say is WOW and thank you very, very much. I read and search always for things to strengthen my faith and knowledge in and about God and this is by far the best. It’s very easy to follow and understand and is a work of art. Great job and keep up the good work as there are so many of us out here that need these types of aids in our journey. Thanks again and God bless you.